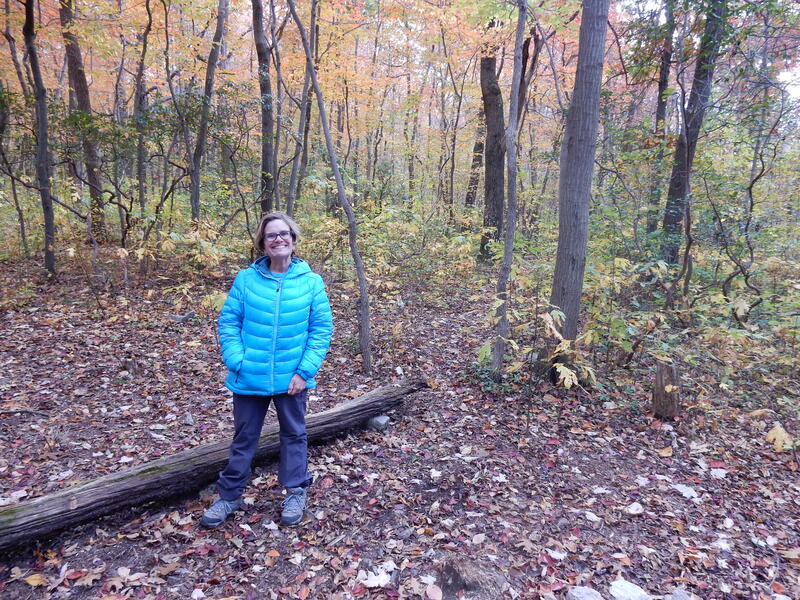 With only one day for hiking this weekend, Karen and I opted for our less rocky southward trip, which brought us back to Jenkins Gap in Shenandoah National Park. As we drove in, we could see right away that the autumn colors were going to be amazing. We got started on our 11.8 mile hike at 10:00, and—as would prove to be the case—it was a good thing that we didn’t start any later. We were able to get parking at both points of our trip without any trouble, for the traffic was still relatively light. The weather was cloudy and in the low 50s, but the persistent wind must have dropped the temperature by 10 degrees, at least. Karen and I were both wearing only a long-sleeved shirt, and despite the heat we generated, we remained cold. But what beautiful scenery! The peak of autumn had, apparently, already passed, but the tree tops were still in different shades, from yellow to red. 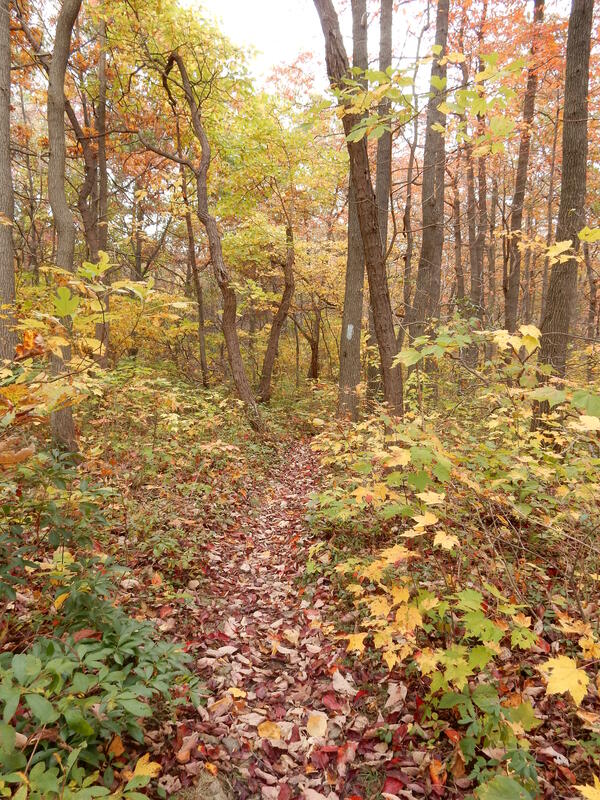 The trail itself was covered in a thick blanket of freshly fallen leaves, which crunched and shuffled beneath our feet. They didn’t make hiking any easier, and sometimes they covered rocks and the gaps between rocks, thereby demanding that we remain attentive to our steps. We saw a number of other hikers, mostly close to lookout points. We also came across a mother black bear and her yearling cubs. The cubs weren’t at all interested in us, but the mother put herself between them and us and wouldn’t take her eyes off of us. I decided not to pause and take a photo, as I didn’t want to cause her any unnecessary stress. 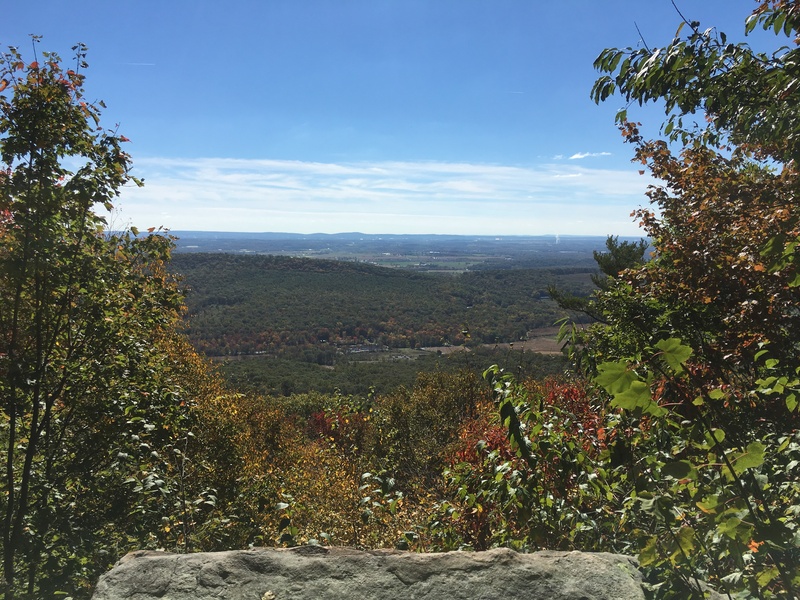 When we were climbing Hogback Mountain, Karen assured me that we had hiked the trail before. I sincerely thought she was delusional, but when we got home, she found her blog of August 10, 2014, and proved that I was forgetful. Good thing we have this record! We reached our destination at about 3:30, and found that, while we were hiking, the park had become crowded with visitors, so that not only were all the parking places taken, but people were parking on the grass. We joined the long line of cars that were exiting the park and were amazed to see the even longer line of cars still entering. We’ve never seen the park anywhere close to being this busy. 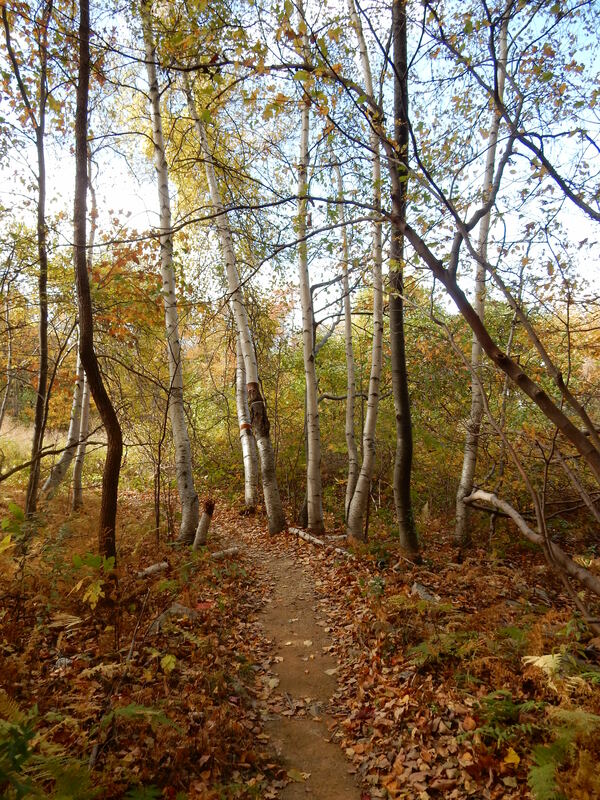 On Saturday, Tod (trail name “Birch”!) and I left the gravel parking lot of PA 183 to hit the trail for Port Clinton. We backpacked and had a pretty heavy load. 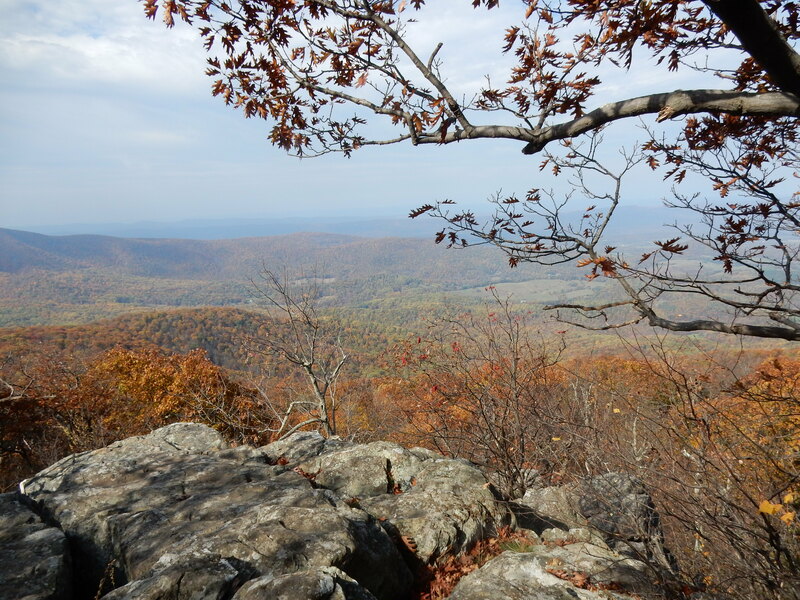 The Appalachian Trail at 183 starts on the ridge so we had the benefit of having a pretty level hike. Once again we were prepared for hunters by wearing ugly orange clothing. Sure enough, it wasn’t long before we met a hunter carrying a big firearm on the trail. As the hunting heated up, the temperature cooled down. Significantly. This past weekend was cold! Hiking was not a problem. We certainly generated enough heat as we hiked on the rocky but easy trail. Amazingly, we ran into the father and two kids that we saw at the shelter last weekend. This time, they traveled South. Otherwise, there were very few people on the trail. By 3 pm we arrived at Eagle Mountain Shelter. A man from Reading, Sam, and his two girls were camping out at the shelter. They had a robust fire going and this gave us a chance to hang out with them, warm up, and make a delicious cup of pumpkin spiced latte. We came prepared for the weather and had winter clothing. We used our new Seatosummit collapsible cooking pot to make a hearty amount of spaghetti with chicken and four cheese sauce. Am I a gourmet or what?!? There wasn’t much to do except freeze so Birch and I climbed into the tent early. I woke up to frost on my eyeglasses and we both strategized to figure out what to do next. Coffee! The trail north from Eagle Mountain started pretty easy but after reaching a beautiful vista it soon turned rocky. You know the story. I am NOT going to write about rocks again! 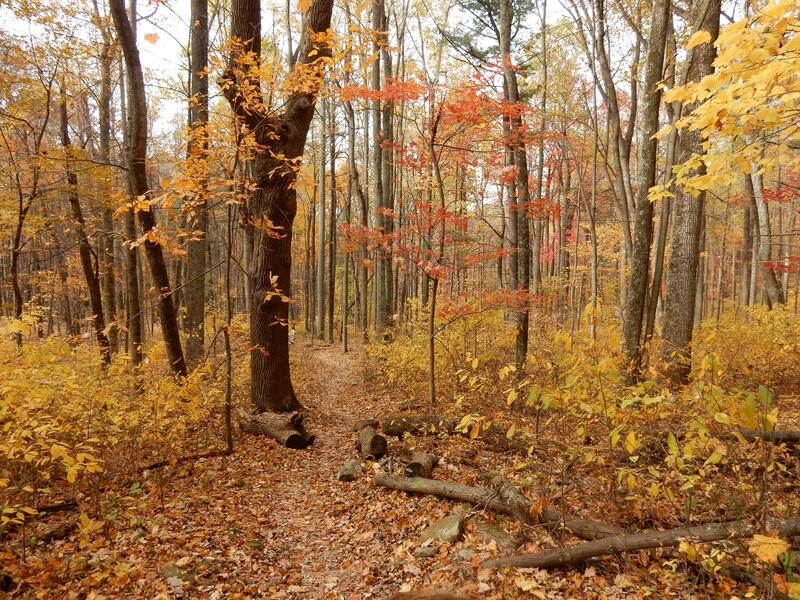 Instead, I’ll say that the trail this weekend was stunningly beautiful. The bed of red and yellow leaves on the floor of the forest made the hike incredibly enjoyable. The beauty of the trees inspired us so that we now finally have trail names. The last part of this hike made us ready to reach the car. Down, down, down! My knees were not happy! Ten minutes off the trail it began to rain. Our timing was perfect and so was the hike. Trying to NOT look like deer! Day One: Swatara Gap to PA 501. Early Saturday morning Tod and I left home for the two and a half hour trip to Swatara Gap. The route is very familiar to us now. We know Route 15 like the back of our hand. We arrived and dropped our second car off at 501 and arrived at Swatara Gap by 9:15 am. The good news? One parking spot left! The bad news? Hunters had gutted a deer and left the carcus right at the front of this spot. The stench was horrible! We tried to get our gear ready and be on the trail in 30 seconds — without breathing. It had to be a record! Did we let the fact that hunters might confuse us for a deer bother us? Of course not! Off we went into the woods. In the two weeks since we were here, the leaves have really turned in color. 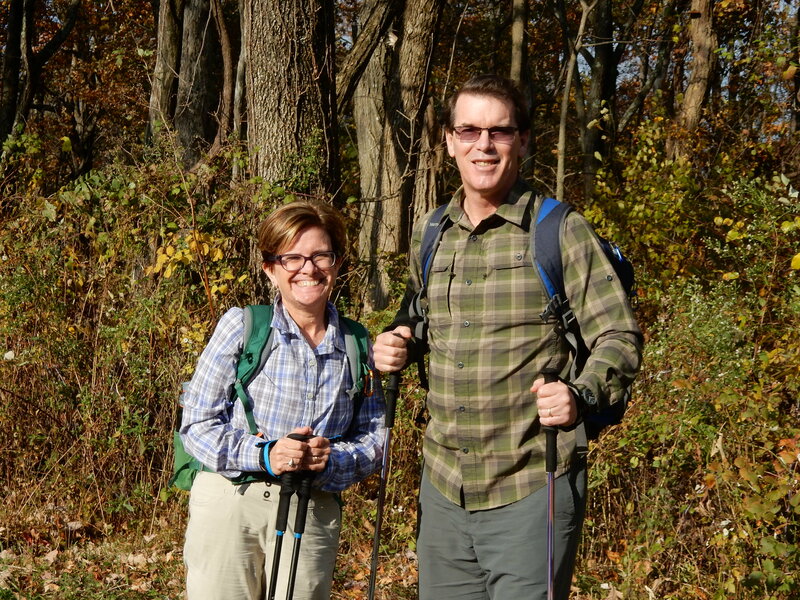 The crisp fall day was perfect for a hike. As usual, we ascended onto a ridge, this time onto Blue Mountain. The ridge was very narrow and we were able to look down on both sides of the mountain. Very cool! What wasn’t so cool was the rocky path before us. It is hard to follow white blazes when you have to constantly look down to watch your feet. At one point I marched us right off the trail. Thankfully, Tod was able to figure out how to get us back on track. of the woods rules. We arrived at William Penn Shelter. It is a really amazing structure with a neat loft that is perfect for a stormy night. Tod turned on our stove to make “coffee” and I soon learned he had a surprise for me. Pumpkin spiced latte! Really?!?! How awesome! As new hikers arrived they all marveled at the incredible smell of our drink. “Butter” and his son and others were there to stay the night but we pressed on. Oh, the joy! From here, the trail was REALLY easy. About a mile before 501 is a really nice camping spot with nice views. From there, it becomes rocky again. We encountered several families out for the day to take in the incredible views. 501 has quite a bit of parking but it fills up quickly and the place was quite busy when we arrived at our destination. Day Two: PA 501 to PA 183. 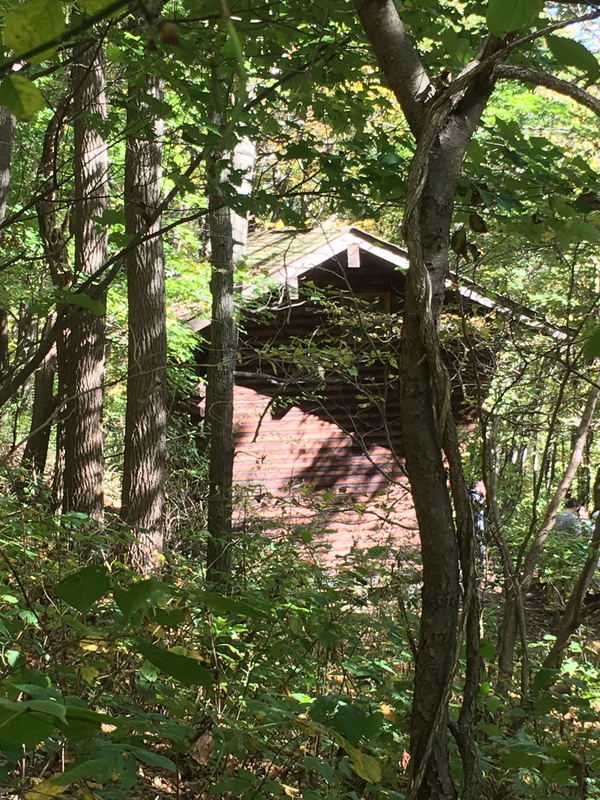 Sunday morning, after a pleasant evening in our comfortable motel room, Karen and I set out to drop off our destination car at the Game Lands Commission gravel parking lot near the ridge on PA 183. Here, we found lots of room for parking. Then, we headed toward our starting point on PA 501, a gravel lot just off the road. This autumn day was beautiful, the sky was deep blue, and the morning air was crisp. We were about a mile and a half into our hike when we met a southbound couple. They introduced themselves to us as “Chief” (a retired chief of police) and “Toad,” and told us that, at PA 501, they would be completing their flip-flop, thru hike of six months. I hardly knew what to say, other than “Congratulations!” How does one rightly acknowledge and participate in such a momentous occasion? Anyway, they seemed like a very nice couple, and we wish them many more happy trails. 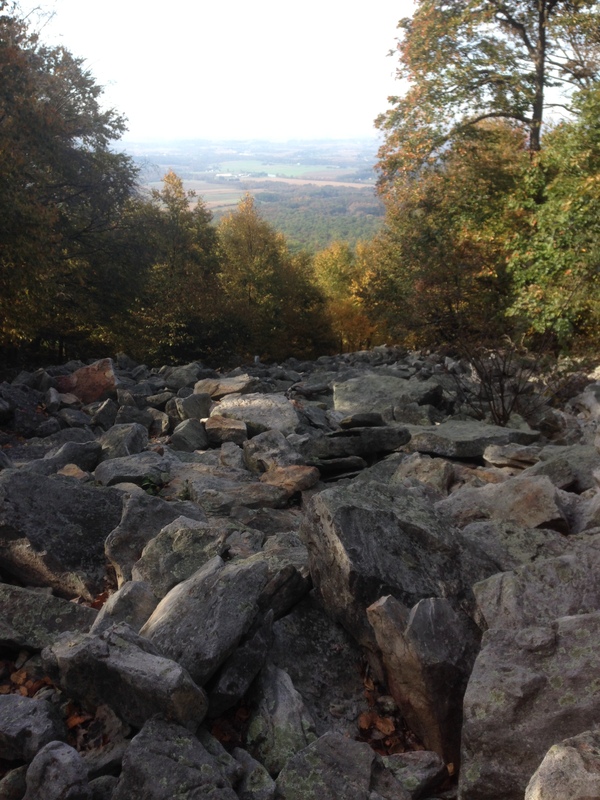 According to the KTA map, we would reach the ominous sounding “Boulder Field” just before the Hartlein campsite. Karen and I tried to psychologically prepare ourselves for this challenge. Already the trail was extremely rocky, and before long it demanded carefully stepping from one huge rock to another. Our ankles certainly were getting a workout. 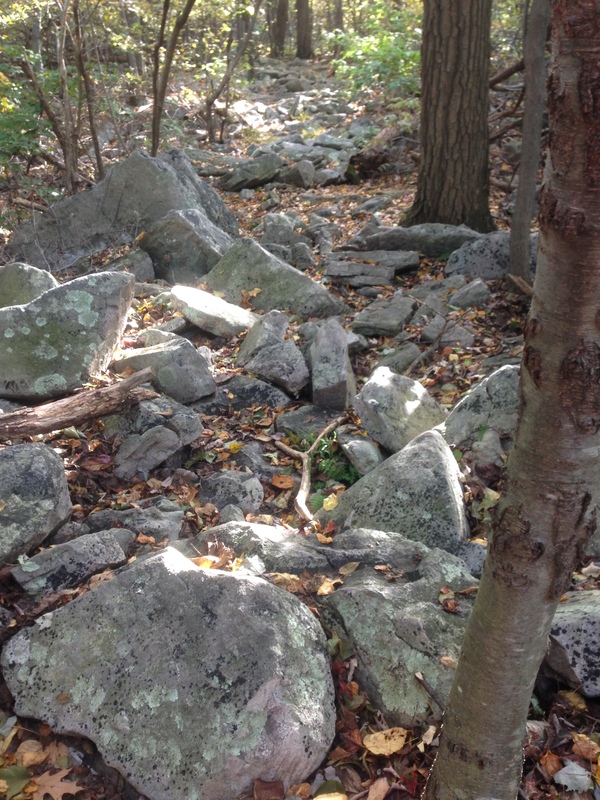 What in the world, we wondered, would “Boulder Field” be like? Well, eventually the trail began to become more manageable, and then we suddenly found ourselves at the Hartlein campsite, where a sign notified us that we were leaving “Boulder Field.” It was only then that we realized that we had already put the notorious section behind us. Contrary to the map, “Boulder Field” is not just south of the campsite, but is about halfway between the campsite and PA 501. 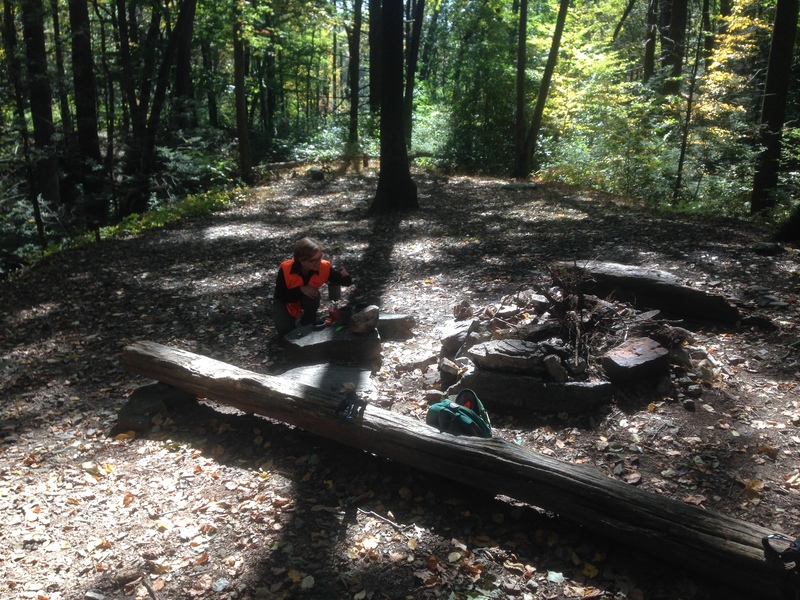 We rested at the Hartlein campsite, on a log before a fire pit, under the shade of tall trees, with a bubbling brook to our right and a meandering creek to our left. Here we had our lunch and coffee break, during which we had the good fortune to meet “El Sol,” a hiker from New Jersey not far into his journey to reach family in Georgia. “El Sol” had pledged himself to bring warmth and light to everyone he encounters on his way, and so we were pleased to make his acquaintance. The Hartlein campsite was both the high point and the turning point on our day’s journey. Before it, one could hardly find a few inches of flat earth to rest one’s foot upon, so covered it was with rocks. After it, it wasn’t unusual to find small stretches upon which one could take a half dozen consecutive steps on flat earth. In other words, the journey to our destination became much easier north of the campsite. 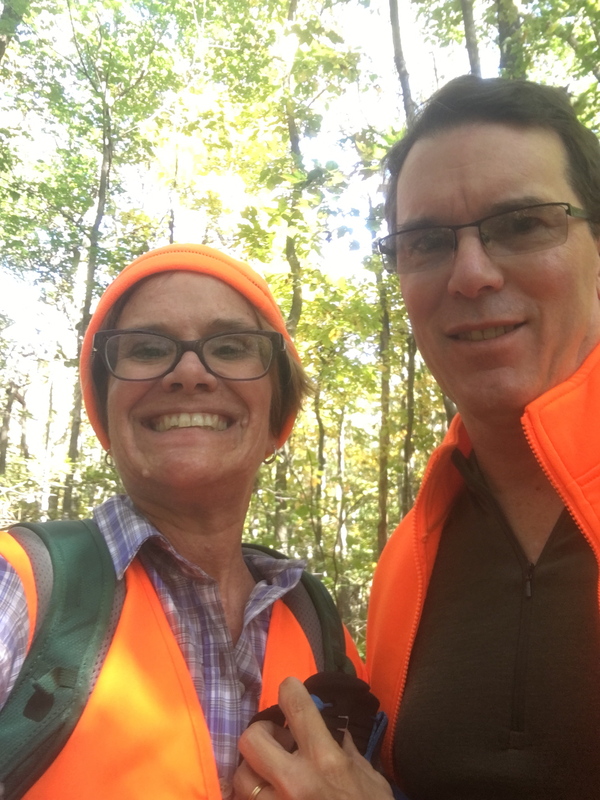 Karen and I felt that we had reached our destination when we came upon PA 183, but we still had another half mile to go, since we were headed toward the gravel road that would connect us to the Game Lands Commission parking lot. The extra half mile was worth the security of having our car further off the road.